Marketing done through newsletters are more effective and beneficial to a business and this is one reason why Newsletter PHP Script are in great demand these days. Today, we are going to talk about some of the best Newsletter PHP Scripts that offer multi-lingual support, professionally designed email templates, email tracking, user data import along with user-friendly dashboard. One of the major issue with newsletter scripts is task scheduling as it is a time-consuming task, but here we have listed PHP scripts that can help you automate complex tasks with a few clicks. That is not all most of these scripts are responsive, comes preloaded with addon facilities and they are extremely affordable as well. So, let’s dive in with the details without sparing a second. 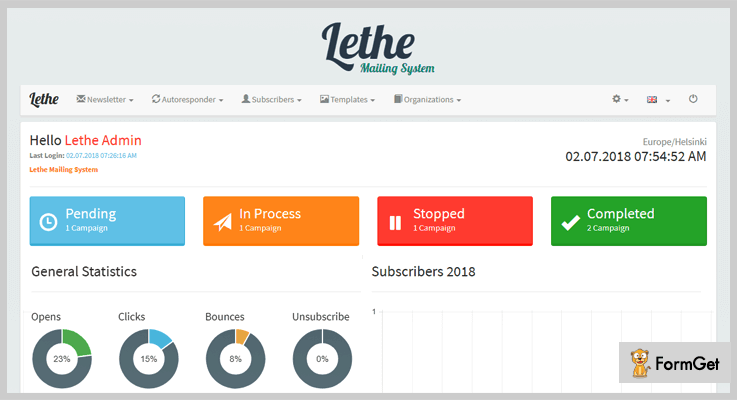 Lethe is a top class Newsletter script with which you can get campaign statistics like number of clicks, opens and bounces, It also provides daily, monthly and yearly reports on different campaigns. With this script, you can create customized and professional looking email templates to bulk email contacts with just a few clicks. For the regular plan of this PHP script, you will have to pay $45. This plan includes 6-month support, quality check, updates and various newsletter functions. The extended plan with enhanced newsletter features and services will cost you $385. With this script you can manage various campaign details like launch date, status, bounces, opens, clicks, campaign progress and more. Moreover, you can create custom campaigns as well. It offers multiple professionally designed templates that can be customized as per your campaign needs. You can also create your own email templates or load them from different sources. This PHP newsletter script allows you to add custom shortcodes and helps you manage & create users from the dashboard itself. You also get blacklist option for spam reduction, data import & export function, autoresponder for sequence emailing and multi-language support along with the script. 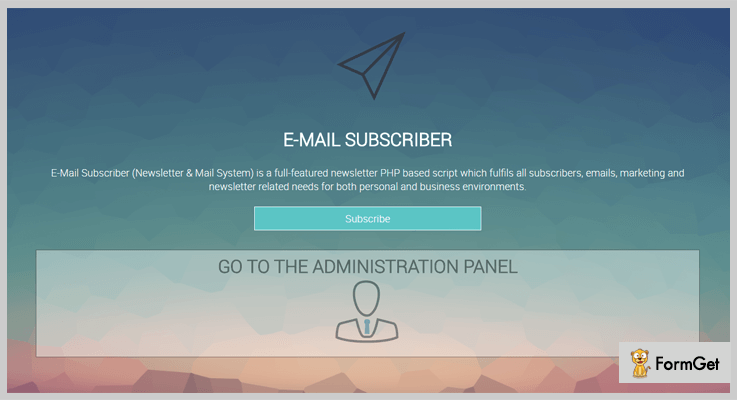 Newsletter System is an advanced PHP script that can help you design templates, send emails, track user actions and allow you to conduct automatic campaigns. You can easily import member details through CSV files, allow swapping between templates, store custom fields and embed newsletter option in forms as well. The first license of this newsletter PHP script is priced around $17. You get features to create, send and track different newsletter emails. The second license comes with various extended features and advanced services at a cost of $85. Offers cross-browser compatibility and supports IE9, Firefox, Safari, Opera, Chrome and other browsers. With this PHP script, you can create different newsletter campaigns and schedule a series of newsletters as well. It also provides advanced bounce tracking functionality which helps you track the bounce actions of a campaign with ease. 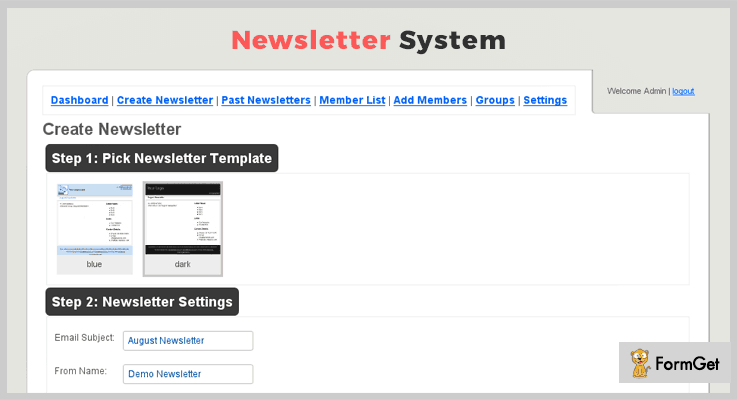 The script also provides users option to subscribe for the newsletter from embedded form. With Berevi Newsletter script you can either create your own newsletter or import it from reliable sources to conduct email campaigns. In addition, the script allows you to create a list of subscribers, group list, and subscriber form as well. It also provides details related to bounce emails like email name, date, bounce error type and the action taken. Regular license of this script comes with a price tag of $23 which includes easy to use dashboard, frequent updates, support and other newsletter facilities. The extended license of this PHP script can be purchased by paying $80. It comes preloaded with multiple email campaign services and add-ons. 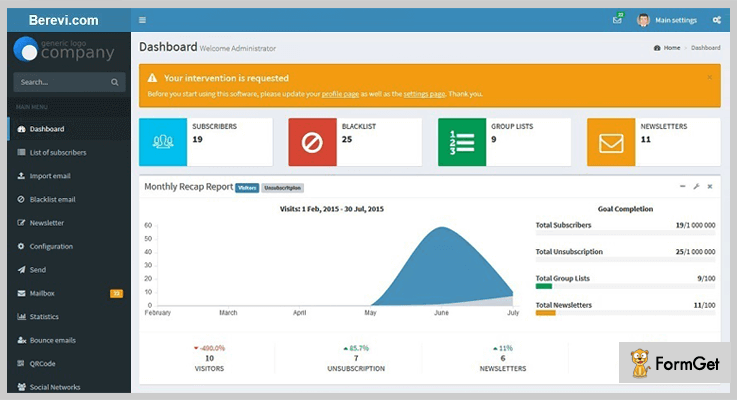 The dashboard holds different type of details like the number of subscribers, blacklist users, group list, newsletter and statistic details. This Newsletter PHP Script is fully optimized for mobile use, multi-lingual support, easy to install, and offers multiple custom designed themes. With this script, you can simply add QRCode images, social networking tags, media files in different campaigns. It offers each & every statistics about email campaigns in text and graphic forms. Plus, you can export subscriber details in txt, CSV, and other file formats. Another PHP script for newsletter using which you can conduct professional-looking campaigns for your member database. This script holds various useful features like visual editor, import/export, email with file attachments, etc. More than one admin account can be created through which users, unsubscribers, themes and other details can be managed. $24 is the amount which is charged for the basic services and newsletter features of this script. The extended plan will cost you $120 with which you get multiple email newsletter functionalities. This script offers an easy to manage newsletter system through which you can send emails to the entire email list or even to selected users. The admin is allowed to create new user accounts, delete usernames, he can add a new admin account and also view last login address of users as well. Using this script you can easily delete subscribers, import/export bulk email list, and edit various site options as well. It also supports the latest software versions and offers cross-browser compatibility. Newsletter is a fast, multipurpose, easy to use PHP script with which you can schedule email sending from your site. This script is equipped with useful functionalities like email editor, mail list sorting by category and more. It also gives you the ability to import email addresses for different data sources. You can enjoy all the services of the regular plan just by paying $60 along with 6-month support, updates and quality check. For the enhanced services of this script, you will have to pay $100. Allows you to easily import subscriber details from text files as well as from the database. 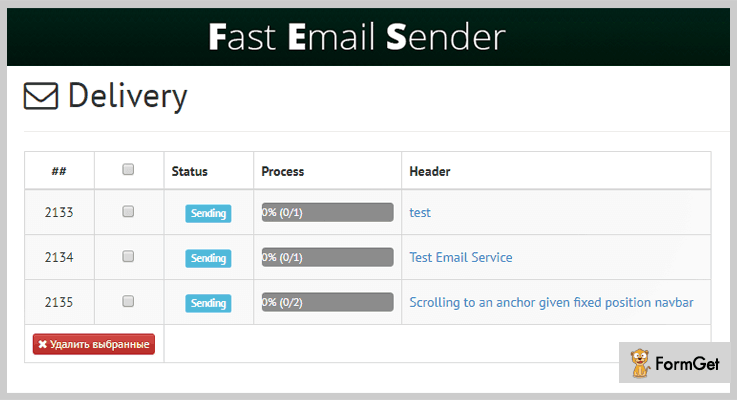 With this Newsletter script, you can send emails via standard mail function, or use SMTP authentication. It comes with an advanced visual editor with the help of which you can customize emails. This script permits you to add unlimited number of attachments, manage unlimited mail list and provides multiple language support. 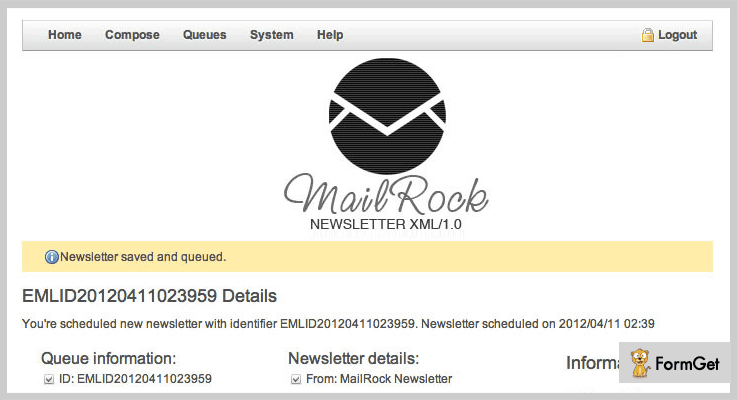 MailRock XML can be used for conducting professional mass mailing newsletter. It offers unlimited attachment facility, mail tracking, helps you create data copies and other advanced operations as well. This script works well without any data source like MySQL or any other. The first plan holds basic newsletter services and it costs you around $16 for all the features. The price for the advanced features of this script is $80. The script helps you perform email tracking as well as links tracking. You can import email contact list from tables or from any MySQL source. With this script, you can create custom emails that can be sent to all or selected email addresses on the list. It supports SMTP, Gmail/Google Apps, Amazon SES, PHP mail, Sendmail, etc for advance emailing. We have now finally arrived at the end of this blog on best Newsletter PHP scripts and I hope here you will find one suitable for your needs. Here, we have tried to explain all the details related to the scripts like features, pricing, description and other details. Still, if you have got any type of queries in mind, do let us know in the comments section below.